Here is the screenshot of the same. Now, this is as big as it gets. What this means is, now even Debit card holders from India can start shopping on international sites like Amazon.com, Walmart.com & many others or even pay for purchases made on Google play store. Till now this was not possible and only credit cards were accepted. With penetration of credit cards being extremely low in India, majority of Indians could never buy from international sites. Does it really work? Yes, it does….We tried it! To be honest, even after getting that SMS alert, I was not too sure if debit card payments would really work. So, we gave it a test run. We tried to make a purchase on Google play store. And to our surprise, it worked beautifully. And, we have tried using Debit cards earlier and they have never worked! We used the same debit card (ending 1627) which you can see in above screenshot! The card got saved without a hitch. When Google play stores a particular card, it first verifies it for purchases, and without much of delay the verification was over and debit card got saved. 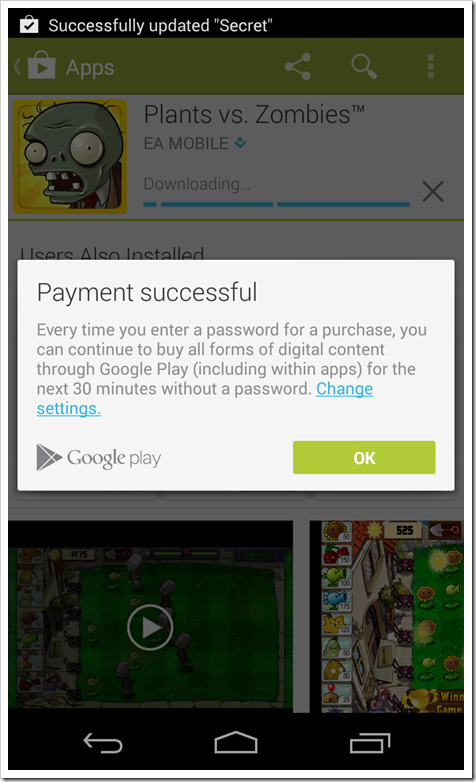 After entering the Google play account password once, the payment confirmation came in. We tried to buy a game that cost USD 0.99 and was priced in India at Rs. 50! For first time users, Google Play makes temporary debit of 50 rupees for verification of Debit card. Once that is done you can start making purchases. In our case it happened quite seamlessly and both the charges (for the app & verification debit) were debited at the same time. Now that HDFC Bank has started offering international payments via debit cards, it’s time that other banks start offering it as well! You too give it a try and let us know if you successfully make purchases on your debit card! HDFC Brings Contactless Payments With UltraCash Sound Wave Based Payments! That’s good news. I once tried making payment for a Google App and it didn’t go thru since they have VISA / Mastercard Netsafe secure on the card, I had to register there to make international payments, but it’s a good one. Arun please suggest me which HDFC debit card I should get to make international payments? Is chip debit cards must for international transactions or non-chip hdfc debit cards also work? Is it possible to pay on aliexpress.com with HDFC debit card…? i want to open new account in HDFC only for google wallet api. but i have a question is HDFC bank debit card working for google wallet? plz. reply me fast…. However it is not working for me. I have a HDFC debit card and successfully i create a virtual credit card using net safe. Eventually it is also accepted by Google wallet but somehow whenever i try to make a purchase, transaction get declined and i don’t know the reason why. The netsafe card is valid for ONLY one transaction. 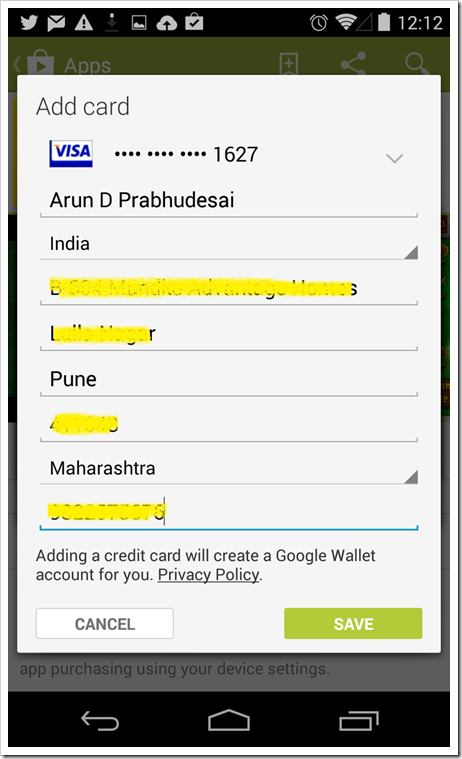 I have hdfc international debit card (master card) but still cards details not register in google wallet. Authorised Problem your card contact your. what its solution.two time contact hdfc customer executive but they have not any positively answer for the same still waiting for the solution and response. How many month after use HDFC bank debit on google play store. Its not working. I have EasyShop Card. Called Customer Care to find that the card won’t work with PayPal or Google Wallet. Activate International Usage from HDFC Netbanking but still not working on Google Play or PayPal. Is your card working now for international transactions? HDFC debit card works and the procedure mentioned to put a request is the same, u have to push a little but politely. Not working for me with HDFC Salary account easy shop debit card, i have sufficient balance. Also the card is enabled for International transactions, also registered in HDFC Netsafe, but still not working. Yes HDFC debit card will work in all international sites tested on play store.But,It will take time about 3months from the account opened date.First time I get an “invalid credit card” error by adding my card and yesterday card get successfully added and tested by buying game…Cheers???? which type of hdfc debit card you using for purchasing on google play? How many days or month are taken to get this message from hdfc bank.From the date you open a account with them. I purchased a song from itunes. They charged the initial Rs.60 when entering card details and i got an alert on my mobile but on purchase,they never asked for the password (Online secure password). Why did they not ask it? Does HDFC validate a transaction automatically without needing a password? 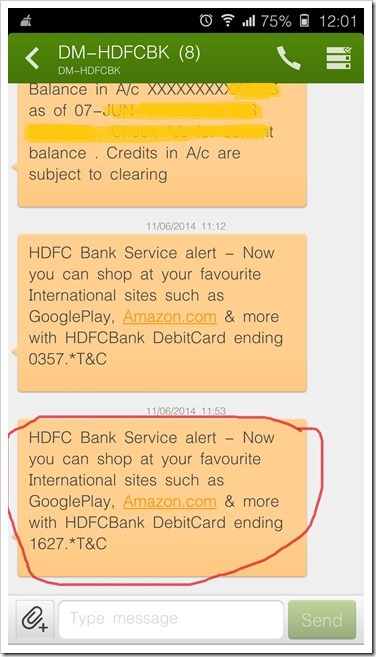 I didn’t receive a message/alert from HDFC for the second transaction. well i have enabled the international usage option on my debit card, still google wallet refuses to add it :( I have the easyshop titanium debit card. HDFC bank. hi I use the same debitcard how did you enable international usage of debit card. I have a salary account. please tell me where is that option to enable and disable international usage of my Debit card. Can anybody test HDFC debit card in Paypal and see if it works? I have tested it on Google Play, Paypal, Amazon and few others. It works quite well everywhere..
how much time does it to successfully do international transaction,i have an hdfc debit card and I have enabled the international usage , how much time will it take to work, I am still not able to make purchases on international website. Does this mean Indian clients can now pay using an HDFC/ICICI debit card to a Saas company and it will be debited monthly automatically in a payment gateway like chargebee ? Guys be sure of using your debit card on international sites. Especially on goole play. Certain transaction are recurring in nature, when you click and agree to their Terms n condition, you also give your consent to them for debiting you on a periodic basis. I am really expecting this feature. Thanks for this update..
Is it possible to pay on aliexpress.com with ICICI debit card…? It means now it should work with PayPal. Yes, it will work with Paypal without a doubt. So you do not need to have a credit card, just add your debit card and you are done!